A 55-year-old Japanese woman was admitted to our hospital because liver tumors were detected by abdominal ultrasonography during a screening examination. Blood examination findings, including tumor makers, were within normal ranges. She had no evidence of exposure to asbestos. 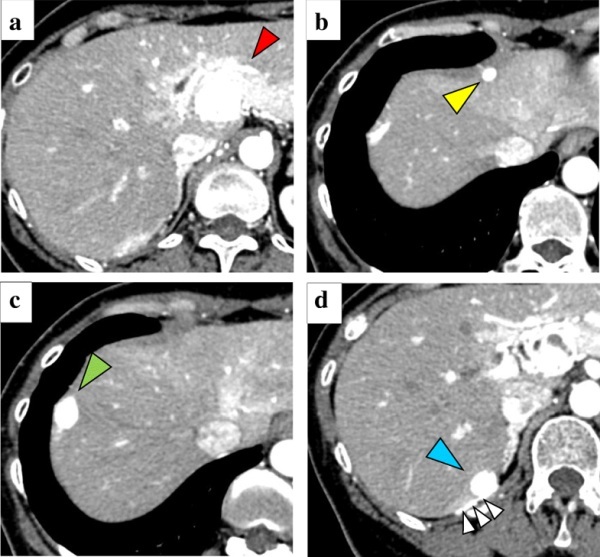 Computed tomography showed four hypervascular, round liver tumors, one in the lateral liver segment adjacent to the hepatic hilus, and the other three on the liver surface. Computed tomography angiography revealed that the tumor in the lateral segment had strong enhancement and was fed from the left gastric artery. In contrast, the other tumors showed no enhancement, and were fed from the right inferior phrenic artery. Abnormal accumulation was identified in the four tumors only with 18F-fluorodeoxyglucose positron emission tomography. It was very difficult to obtain a definitive preoperative diagnosis, but surgical resection was performed because we considered potential malignancy. Laparotomy revealed the principal site of the tumor in the lateral segment was on the hepatoduodenal ligament, and all other tumors were on the diaphragm. A left lobectomy and partial diaphragmatic resection were performed. The final pathological diagnosis was multiple malignant epithelioid mesotheliomas. Our patient has had no recurrence for 20 months postoperatively.